Radiation from the Fukushima nuclear disaster that occurred four years ago, in 2011, continues to contaminate the surrounding area where the power plant is located and is spreading beyond Japan. “Composition Fukushima 2011” is Kenji Kojima’s response to the ongoing nuclear calamity. Online photographs from the international press related to Fukushima and the unfolding events to contain the radiation are accompanied by a soundtrack. But this is no ordinary soundtrack. The music is actually a compilation of musical sequences produced by the images themselves. A kind of transcoding through an algorithm that converts the color data of the images into musical notes, each photograph producing its own melody. “Composition Fukushima 2011” is also a kind of techno synesthesia and proof positive that aesthetic principles of form, rhythm, symmetry, repetition, proportion, scale, etc. universally apply—here facilitated by the global platform the Internet alone provides. The exhibition is part of a curatorial series at MediaNoche, presenting media projects on environmental issues. Judith Escalona, Director of MediaNoche, curates. 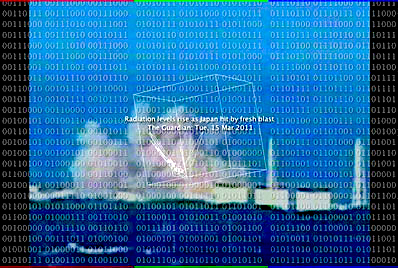 "Composition Fukushima 2011" is a distillation of an earlier project “RGB Music News”, covering the news cycle worldwide with 335 musical sequences and their corresponding news stills for the entire year of 2011. Kenji Kojima is a visual artist whose work spans the centuries in technique and technology. In 1980 he moved to New York from Japan, where he continued painting using egg tempera and techniques from the European Middle Ages--an arduous process requiring careful planning. The advent of the Mac computer allowed Kojima to visualize and plan his egg tempera paintings more effectively. It also sent him in a new direction, authoring software for internet-based artworks. In 2007, Kojima created the RGB Music series, an interdisciplinary work exploring the relation between images and music. In 2008, as part of the series, the installation "Subway Synesthesia" exhibited in New York City. In 2011 "RGB Music News" featured news photographs visually and musically. The RGB Music series has exhibited in media art festivals worldwide, including Europe, Brazil, and the United States. His work has been cloned and archived at Rhizome in the New Museum of Contemporary Art, New York.